Thanks for visiting our new online shopping experience! Please visit our sponsored links! We are currently exploring payment options for merchandise you find on this webiste. We are very excited to offer our newest addition to www.jack-a-roe.com: ANDERSONGLASSWORKS from Haiku, deep in the heart of Maui, HI. See a few items that we have available for sale below. We will be adding more items soon! Anderson Glass Works - Handblown glass from Maui, Hawii. This beautiful piece features a starfish on a beaded necklace. Anderson Glass Works - Handblown glass from Maui, Hawii. 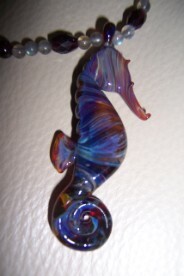 This beautiful piece features a seahorse on a beaded necklace. Anderson Glass Works - Handblown glass from Maui, Hawii. This beautiful piece features a stingray on a beaded necklace.